Leema Xone review | What Hi-Fi? Looking for a great all-rounder? The Leema Xone isn't it. The Xone has some extraordinary abilities, but it won't produce crowd-pleasing results for everyone. It has a distinctive character, one that some will adore and others discard as wholly unacceptable. We reviewed the Lemma Xone back in January '08; since then, there have been subtle changes on the main drivers and a hefty £300 reduction in price. That's what has prompted this retest. 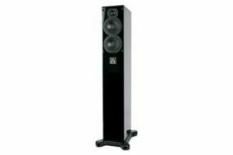 These are slim floorstanders, with twin 10cm drivers working in a two-and-a-half-way configuration – one of the larger drivers does both midrange and bass, the other helps out only at low frequencies. Our review samples came in a gloss black finish, which adds around £150 to the standard cost quoted. These speakers' biggest drawback is a shortfall of deep bass power and weight. If you want seismic basslines with your Dark Knight OST, or to hear a large dose of scale and authority with large-scale classical works, these are not the speakers for you. They sound too lean and lightweight for that, even when positioned close to a rear wall. They don't really take to high volume levels either, sounding shouty and hard-edged when pushed hard. In 2008, these shortcomings didn't seem obvious; against new rivals from Spendor, PMC and Dynaudio, they stand out. And yet… These speakers are amazingly agile. We haven't come across a conventional multi-drivered alternative that responds to dynamic and volume changes with the skill of these Leemas. They're massively detailed too, uncovering layer upon layer of fine detail from a complex piece of music such as Arvo Part's Tabula Rasa, and delivering it with exceptional organisation. Timing is simply outstanding, too. There are only a handful of speakers we've heard that come within touching distance of the way the Xones track the pace of a piece of music. If rhythm and speed are important, we doubt you'll find better at this money. You can add seamless integration to the list of plus points, too. These Leemas are no all-rounders. But, if you like what the Xones do, there's nothing else that comes close at anywhere near this price level.